Dawn of the Planet of the Apes picks up about ten years after the events of Rise of The Planet of The Apes (2011). In that first film, which rebooted The Planet of The Apes franchise, researchers seeking cures for human diseases found a potential cure for Alzheimer's and, while testing the drug on chimpanzees, discovered a side effect: the mental capacities of the test chimpanzees began increasing. By the end of the film a young chimpanzee named Caesar (Andy Serkis) escaped from captivity freeing a number of apes and other simians from the lab and from the San Francisco zoo. Caesar was raised by one of the scientists (James Franco) and as a result experienced good and loving interactions with humans, but one of the apes Caesar rescued was a laboratory chimpanzee, Koba (Toby Kebbell) who had been maltreated in the worst way by the researchers. Rise ofThe Planet of The Apesended with the apes slipping away into the woods near San Francisco while an additional adverse side effect to the Alzheimer vaccination—simian Flu— began affecting humans. When Dawn of the Planet of the Apesbegins almost all of humanity is wiped out by the flu strain and Caesar, Koba and the other apes have built a harmonious colony near a waterfall in the woods not far from San Francisco. The drama in this new film centres around a group of humans, led by a man named Dreyfus (Gary Oldman) and his lieutenant, Malcolm (Jason Clarke), who have begun re-inhabiting San Francisco. The humans are running out of fuel and in desperation look to a local hydro power plant as their last hope to generate electrical power, both for personal survival and to power a radio transmitter which could potentially contact other human survivors if there are any. The hydro power plant also happens to be right where Caesar has put down roots with his ape colony. Caesar,who in the first film was part of a human family, now has a mate and family. He's become the king of the apes, with Koba as his lieutenant, and the orangutan Maurice (Karin Konoval) as his advisor. 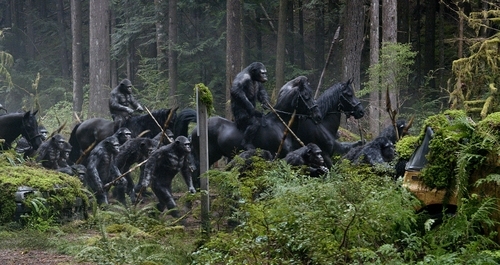 The film details the interactions—both peaceful and combative—between the apes and humans as they struggle for survival. While living with humans Caesar had learned sign language and eventually even began to speak. This knowledge is shared among the apes and provides opportunity to be more ambitious in their community endeavours which leads to the second law: "Apes Together Strong." Trust in this philosophy and a deep mistrust and hatred for humanity leads the tortured Koba to plot a war against the humans in opposition to Caesar's wishes. 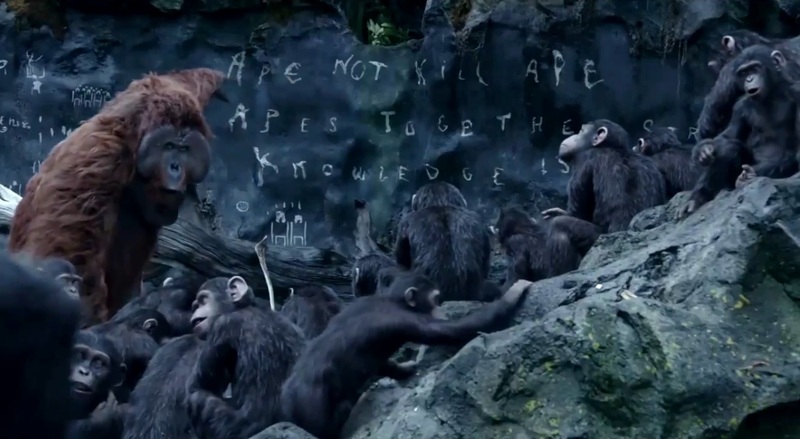 Caesar uses "Apes Together Strong," as a call to peace while Koba uses it as a call to war. The first law of the apes "Ape Not Kill Ape" is the one that will stick out the most for Christian viewers since it lines up with fifth commandment, "You shall not murder." In his Small Catechism Martin Luther asks "What does this mean?" The answer is given: "We should fear and love God so that we do not hurt or harm our neighbour in his body, but help and support him in every physical need." The apes have no fear or love of God and no knowledge of God. Neither does He enter into the thoughts or concerns of the humans in the film. 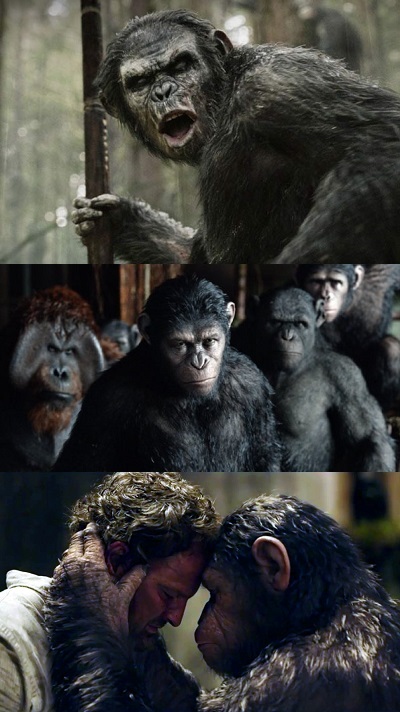 But what is apparent is the struggle to look after the “neighbour.” While Caesar is concerned greatly for his growing family and is shown fulfilling this commandment in his interactions with the humans, Koba puts the ape community first and disregards the idea that humans could be neighbours worthy of care. There is a parallel struggle within the human community. The lieutenant, Malcolm, is concerned with fulfilling this commandment by working towards peaceful coexistent with the apes, while Dreyfus disregards the idea that apes could be neighbours worthy of his care. The film is at its best when it explores the fifth commandment at the intersection of prejudice and empathy, at the crossroads of selfishness and selflessness. Better and more consistent than the first film, Dawn of The Planet of The Apes is a major achievement in motion-capture performances. Andy Serkis who played both Gollum in Peter Jackson's The Hobbit: An Unexpected Journey (2012)and King Kong in King Kong (2005) has distinguished himself as the premier performer in this style of acting and brings an amazing range of emotions and subtlety to Caesar’s character. The writing in some spots can be a bit predictable and simple and the film doesn't have well-written female characters. (It was a surprise to discover that Judy Greer plays Cornelia, Caesar's mate in the film, as she was given practically nothing to do in the film.) That being said the film again provides a strong, positive father role model in Caesar, with an emphasis on family, continuing this surprising new trend of the positive father-figure in recent blockbuster Hollywood films. Dawn of the Planet of the Apesputs this franchise on solid footing for future instalments both technically with its well-crafted CGI, and emotionally as it delves into some of the big questions in life revolving around caring for others in their daily needs. ShortList interview with Andy Serkis. Luther's Small Catechism, Concordia Publishing House 2006, pg 12.